Yesterday, I was quite pumped up with energy and general feel of goodness after I returned from an early morning visit to the beach. The beach is almost like a temperamental individual exhibiting different tempers at different times of the day and be warned, every beach is distinct and has its own shade of personality. I learned all this by visiting some beaches in Goa. I was literally in a hazy sea of thoughts when my domestic walked in for the day. She had her usual smile and charm and inquired me after the sand that she had spotted in the entrance. With an excited demeanour, I told her that we had gone to watch the sunrise in the nearby beach. She nonchalantly replied: "We have been living here for so many years but have never visited the famed beaches of Goa till date." Her reply stirred me. It rattled my thoughts. I wouldn't know how to react to her reply which was a tone mingled with part regret and part resignation to her life. Implicitly, I asked her when she came to Goa. "Just after getting married," she replied. She has been married and living in Goa for about 18 years but the beaches were lost to her and her family. There was a beach quite close to where she lived but the time and zest to go and visit that beach was lost on her family. I wondered why should one go to the beach? Does one want to feel a sense of contentment that comes with living in one of the most sought after tourist spots or does one go there to marvel at the wonder of nature and take in the beauty that everyday existence cannot possibly provide? I realised that going to the beach is a privilege of time and leisure. A chasing after beauty that allows one's heart to be puffed up with gratitude and warmth. 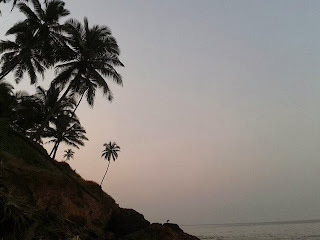 I also wonder whether by not visiting a beach in Goa, did I miss out on the essence of the place? Do I visit beaches just because it would be a shame to have lived in a place filled with beaches and not have visited them. Some of these questions could niggle me endlessly and chances are that I might not even arrive at a legitimate answer. Till my mind rests, let's go to the beach and take pictures that make others yearn and drool simultaneously. Have you thought why you do what you do. I go to the beach because the waves, the ocean the eternal infinite sight - all put me to ease instantly! I have been to Goa 3 three and every time we enjoyed the beaches, sun and sand and of course the togetherness of family. The beaches of Goa are beautiful.Do visit the beaches , Susan more often. I find watching water very peaceful. And irony is I am hydrophobic.. So perhaps finding reasons behind what we do is a very complicated affair and more often reveals a very different side of our personalities. Like I am hydrophobic but enjoy watching water.. I go for the serenity! I go to play in the waters.. walk into the waters, play with the waves, get drenched.. the water is one element I've realized recently is something very close to me.. Sus..
For me as an Aquarian, water bodies like the beach and lakes are definitely soothing and gives me a chance to detach from the rest of the world and just be in my own private soothing world. Susan, I've been away and am now trying to catch up on missed blogs. It's a futile attempt. But I did read your post about Sam. My condolences. It was a very touching post. I like your thoughts/questions about beaches. Perhaps it is those of us who have the luxury of leisure who most appreciate them. Those who have more difficult lives may not have the time to ponder their beauty. Great posts my dear Susan. How I enjoy your writing.